A very famous bass lure. I have talked to many folks who swear by it. I have an old box from the 50's that says "Noisy action kills bass". Never fished with it much myself. Large lip caused it to splash and waggle from side to side. 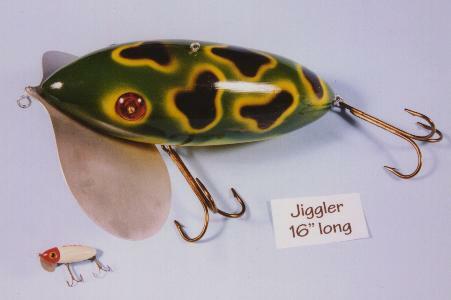 It features an large aluminum lip, handmade plastic eyes, and a frog pattern paint job. Finish: Green body with yellow and black spots and yellow belly.